Meet Alec Nelson a pitcher with a nasty curveball who hopes to one day work in a front office for a pro sports team. Career goals/dream job: MLB or NBA front office. Favorite baseball movie: Bull Durham, but this excludes Field of Dreams because that movie is more than a baseball movie, it’s the best movie of all time. Favorite thing about club baseball: Making lifelong friends, including guys that will probably stand up at my wedding. That is, if Trafton can make it to my wedding on time. Career goals/dream job: I would like to become a high school social studies teacher and head coach for a varsity baseball program, eventually shifting over to writing curriculum and education policy. Get to know our Vice President, who also served as our Fundraising Coordinator last year, Chris Trafton! Notable stats: In four years as a starter, our overall record is 66-21. Favorite club baseball memory: Rivalry games vs Winona State and putting up the cage at the stock. Favorite thing about club baseball: Getting to play with the same group of guys for four years and continuing to play competitive baseball after I thought I would be done playing when I came to UW. Career goals/dream job: I would like to develop new medicines in the pharmaceutical field. Meet senior pitcher Nick Zacharias, an aspiring surgeon who is also engaged! Notable stats: Having a zero era my sophomore year. Junior year pitching in the regional championship game and not allowing a run in six innings of work. Favorite club baseball memory: Pitching against Eastern Kentucky and beating them freshman year because they went on to win the World Series that year. Favorite thing about club baseball: Road trips with the guys. Career goals/dream job: I would like to become a surgeon. This Saturday, April 21, your D2 Badgers (14-2 overall, 10-1 Northern Plains Central) will host UW-La Crosse (9-1, 9-1) for the conference title and a trip to the postseason at 9 am on campus at the Near West field. Come join us for what should be a great battle! Get to know our super senior Andrew Wolfe. He is the former Vice President of the Club, our resident fishing expert (him and his dad own a Tampa Bay fishing record) and the team prankster. Favorite club baseball memory: Beating DePaul by 17 runs after the benches cleared my freshman year. Favorite thing about club baseball: The camaraderie and lasting friendships and ability to still compete at a high level. And cuddling with Bobby in Florida. Career goals/dream job: I want to get my doctorate in physical therapy. I’d like to eventually work with a sports team or children and I potentially want to own my own practice. D1 started their season off on a high note, going 4-1 in Florida and getting several quality wins. In its first time outside since October, the Badgers defeated the No. 5 ranked team in the nation. Sophomore Ryan Gassner and freshman Trey Mohr combined to allow just three hits. Wisconsin clobbered six extra base hits, including a home run by freshman shortstop Chase Zernich. Freshman outfielder Gus Turner-Zick and sophomore outfielder Jared Eichorst each hit triples to help power the offense. The Badgers faced another top ten team in No. 8 UCF, the national runner ups a year ago, and fell in a tough game. Zernich again shined at the plate, going 2-for-3. Freshman catcher Ryan Hubbell and sophomore center fielder Austin Grover each had doubles. The Badgers trailed by two in the bottom of the 7th, but rallied for three runs and a walk-off victory over the Tigers. With one out, senior first baseman Nick Newburg singled to get the rally started. Hubbell and junior Justin Gorman followed with singles of their own to load the bases. Grover then reached on an error, scoring Newburg. Turner-Zick knocked in Hubbell to tie the game and bring up senior second baseman Brian Mariska. Mariska delivered a sacrifice fly to plate Gorman and give the Badgers the win. Mariska went 3-5 with a double and a home run in the game. Freshman Nolan DeGreef threw all seven innings allowing just three earned runs and striking out six. Wisconsin used a six-run third to power past Kent State. Eichorst continued to rake, going 4-for-5 with a triple. Five other Badgers had multi-hit games, including Hubbell who also drove in three runs. The Badgers were trailing 5-3 after seven innings, but plated eight runs in the eighth to defeat the Knights. Freshman infielder Will Strauss had a big day at the plate, going 3-for-5 with a double and an RBI. Mariska delivered the big hit in the eighth, driving a single that scored three runs, the last coming in on an error. Next up for the Badgers after their impressive week is a three-game home series with UW-Eau Claire. They will play Friday at 7 p.m. and a doubleheader Saturday starting at noon, all at the Near West Field on campus. The No. 16-ranked Badgers compiled a 4-1 record in Tampa, starting off their season on the right foot. Sophomore Ryan Molini allowed just one earned run in four innings of work and junior Jarrett Benson didn’t give up a run in relief to help the Badgers earn their first victory of the spring. UW scored five runs in both the third and the fifth. Senior Andrew Wolfe smacked a double and a triple and junior Tyler Behle scored four times. When Mizzou scored two runs in the top of the 7th to open up a four-run lead, it looked all but over. But with just three outs left, Wisconsin rallied for four runs, thanks to clutch hits by freshman outfielder Jackson Preschler, junior outfielder Ryan Wenzel and junior second baseman Alexis Quintero, who ripped a single into left field to plate Preschler and tie the game at 6. Senior Drew Rust went out for his second inning of work in the top of the 8th and held the Tigers scoreless, giving the Badgers a chance to win it in the bottom of the 8th. With Molini on second, sophomore first basemen Karson Krueger turned on a fastball that hit the chalk over the first-base line, scoring Molini and giving UW its second win of the day. The bats went quiet against the Wildcats and the Badgers were unable to push anyone across the plate, falling for the first time in the spring. Junior Jarrett Benson allowed just one earned run in relief for Wisconsin. The Badgers avenged a tough loss to the Warhawks from last year’s spring training trip, this time grinding through a 3-1 victory. Freshman Ryan Winters was stellar in his club baseball debut, pitching six scoreless innings. Sophomore Charlie Goldring closed the win out in the seventh. Junior shortstop Jake Gain delivered the big hit, driving in senior catcher Bobby Ehrlich and senior center fielder Chris Trafton in the first inning with a double. In perhaps its toughest game of the trip, the No. 16 Badgers took on the No. 15 USF Bulls, a team that has already won its conference and will be playing in the Dixie regional tournament. The Badgers got down early, as senior Alec Nelson surrendered a two-out, two-RBI single that put the Bulls up 2-0 in the first. But that would be all USF would score for the rest of the game. Nelson would settle in for the next two innings, quieting the Bulls bats. Senior Andrew Wolfe then entered the game and tossed two shutout innings himself. In the 5th, Gain drove in junior outfielder J.J. Lambl with a scorcher down the left field line to cut the USF lead in half. 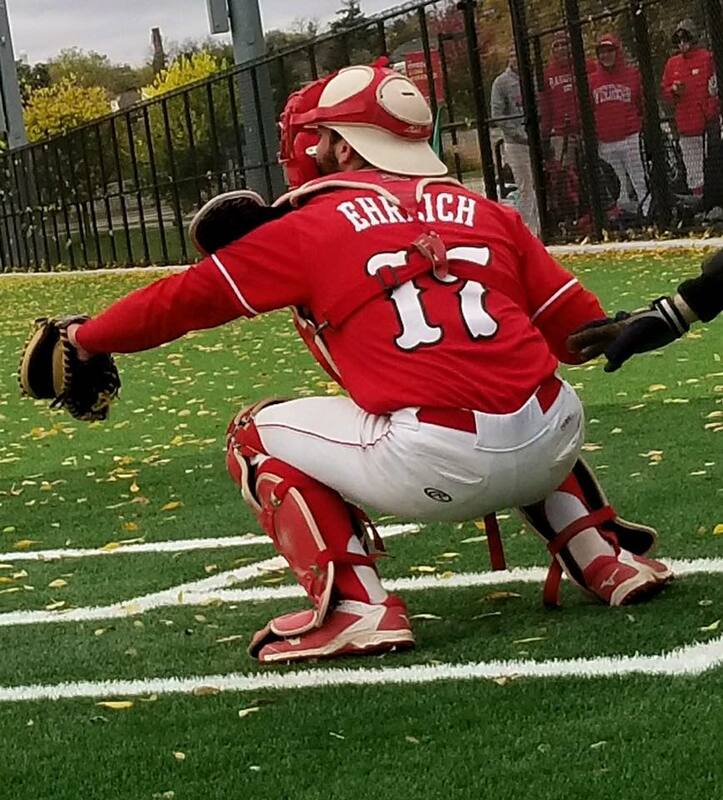 The deep Wisconsin staff continued to shut down the USF bats, as senior Nick Zacharias fired two scoreless innings. In the bottom of the sixth, freshman Tony Spence came up clutch, smacking a two-RBI double into the gap to give Wisconsin a 3-2 lead. Junior Aaron Van Deurzen then pitched a flawless eighth before handing the ball over to Rust. With the tying run on third and two outs, Rust got the USF three hitter to ground out to Spence, giving the Badgers a big non-conference victory. Next up for Wisconsin is UW-Stevens Point. They will host the Dawgs at the Near West field on campus at 4 p.m. Saturday April 7th and for a doubleheader beginning at 10 a.m. on Sunday April 8th. We hope that you come out to the field for some spring baseball!